MHT files are MIME encoded HTML (MHTML) typically found on Windows. MHT Files are also the way Internet Explorer saves web pages. MHT can end up on your Mac if you switch and bring your email with you, or if people use a misconfigured mail server. File Juicer can extract HTML and images from MHT files. 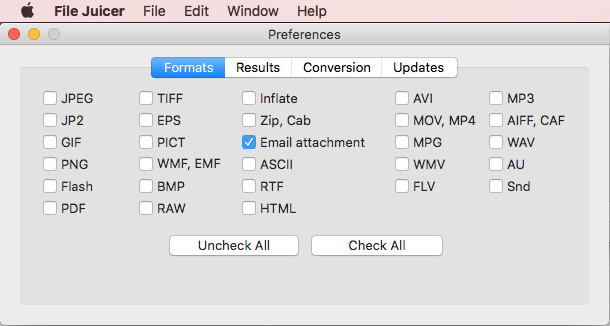 You need only enable the email attachment in the preferences as MHT is uses an an email file format as encoding. The only requirement is that they have the .mht extension so it can apply the stripping of the specially encoded characters in to convert it to HTML. I recommend that you uncheck the duplicate removal in File Juicers preferences when juicing MHT files. It is common to reuse an image under different names in html. Removing duplicates can result in missing images in the HTML.